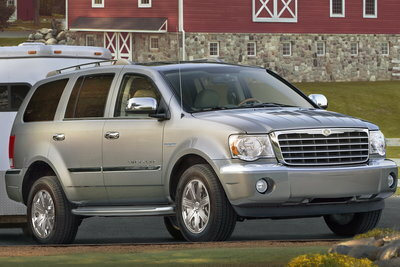 Chrysler gets a mid-size SUV based the Dodge Durango. Like the Durango, the Aspen can seat up to 8 in 3 rows of seating. Two V8 engines are offered, a 4.7L V8 and a 5.7L HEMI (R) V8. A 5-speed automatic is standard. Both RWD and 4WD versions are offered. In 2009, a hybrid system joins the lineup pairing the 5.7L V8 with a version of the two-mode hybrid system found in some GM vehicles. A two-mode hybrid version joins the lineup for 2009. The Aspen Hemi Hybrid pairs the 5.7L V8 with the two-mode hybrid system found in GM vehicles. The hybrid has an estimated fuel economy of 19 city/20 highway. Non hybrid models benefit from updates to the 5.7L V8. The updated Hemi increases power and fuel economy.